9.22.11. Tonight I attended one of the most exciting lectures I've come across in a long time. It's Seattle Design Festival week here in tonight was the much anticipated presentation by designer, writer, and educator August de Los Reyes, Design Director at Seattle-based Artefact. 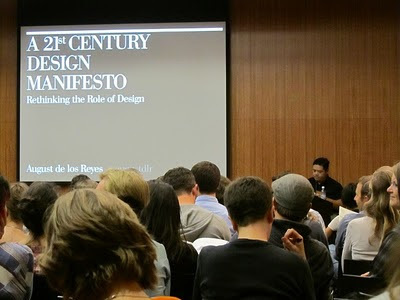 August showcased his '21st Century Design Manifesto' and topics ranged from pop culture vampires and zombies to more lofty topics like self-reliance and timelessness. Really enlightening, really inspiring.